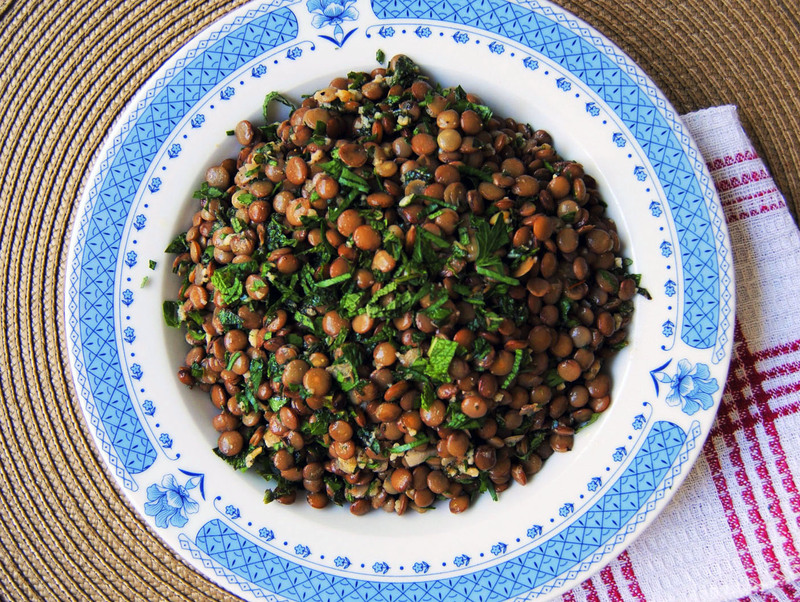 A simple but flavorful lentil salad with plenty of garlic and fresh herbs. One day, I’ll have a garden. Not a flower garden, but a vegetable garden. Tomatoes, cucumber, squash, potatoes, carrots, lettuces, and lots and lots of fresh herbs. There’s just something so wonderful about eating something that you planted, watered and picked yourself. It tastes better, but it also feels better. Despite the extra effort and care that went into whatever it is you’re eating, there’s also a simplicity to it which somehow feels especially satisfying. I don’t have a garden yet, because I live in the center of Lisbon in a tiny but perfect apartment. Still, I try to use the freshest ingredients possible whenever I can. I particularly love to cook with fresh herbs. Maybe I didn’t pick them myself, but they still taste like they came straight from my future garden. Fresh, time-traveling herbs. What more could I ask for? Anyway, if you’re lucky enough to have a garden here in the present, and there happens to be parsley and mint growing there, go out and grab a big handful of each and try this recipe. Or, if you’re like me and don’t have a garden (yet! ), just pick up some fresh herbs at your local market and try this recipe. It’s simple, hearty, and satisfying. Best of all, it’s packed with fresh herbs! The first time I made this, I ate it plain and it was delicious. The second time, I put sliced avocado on top and it was delicious. The third time, I ate it drizzled with yogurt and a bit more lemon juice and – you guessed it – it was delicious. It would be a tasty side dish, but it’s also hearty enough to be a vegetarian main course. Also, don’t be scared of the amount of garlic in this! It’s a lot, sure, but it’s cooked in olive oil so the flavor is quite mellow. Bring lentils and 3-4 cups water to a boil, and simmer until lentils are tender. Drain lentils and set aside to cool. Heat about two tablespoons olive oil in a skillet over medium heat. Add garlic and cook until soft, about 7-8 minutes. Remove the pan from heat and stir in the remaining olive oil, lemon juice, cumin and allspice. Pour the garlic mixture over lentils and mix thoroughly. Add fresh herbs and season to taste with salt and pepper. Serve at room temperature or chilled. Eat plain, or top with yogurt or sliced avocado. Your mom looks forward to helping you get a garden going one of these days! 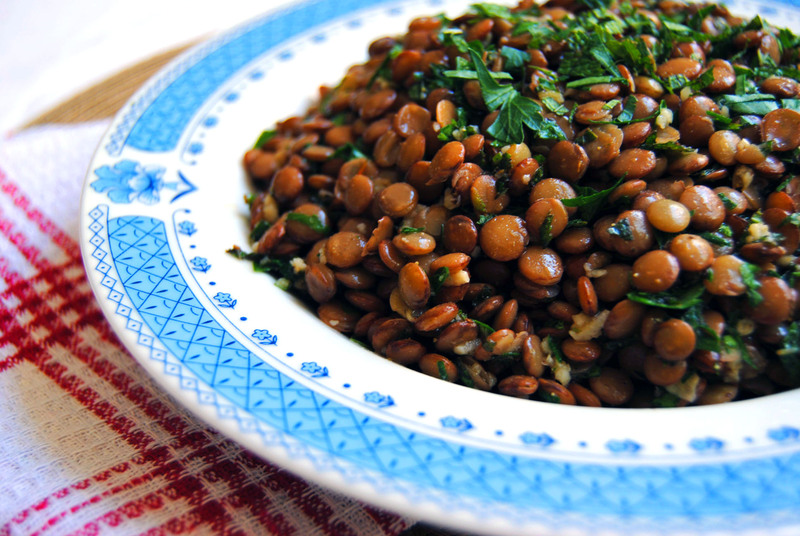 lentils are wonderful. it looks like a great dish!